Gambela is a beautiful but dangerous region. The remote lowland in Ethiopia is impoverished and has become a hotbed for conflicts between different ethnic groups. 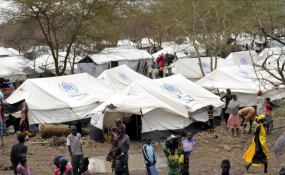 But for about 400,000 refugees from South Sudan the Gambela region has become their new home. Over two million people have fled the ongoing civil war in South Sudan to neighboring countries. Ethiopia has now become Africa's second largest refugee hosting country after Uganda. But given the numerous challenges Ethiopia faces, what does the future hold for these refugees? We travelled to a refugee camp near the South Sudan border, which provides shelter to around 60,000 refugees. It is jointly run by the United Nations (UN) and the Ethiopian government. Our camera team is a welcome distraction for the children. Due to limited facilities, not all of them have the opportunity to attend school and spend much of their time struggling to cope with the trauma they experienced on their journey to Ethiopia. Nyjawech Ruey is a young mother with four children. She fled South Sudan in 2014. "When the war erupted the children were set on fire, many of them were abducted," she tells DW. She feels safe in the refugee camp. For now, it is her "temporary" home -- but it's already been 4 years since she arrived. Without permission to seek work outside the camp, her future is uncertain. Lack of education is another challenge for her and her children. "When you compare the number of refugees with the service, it is less than the standards set out by the UN commission for refugees (UNHCR)," Negese Demesa, the regional coordinator for refugees explains as he shows us around the camp. "More people means fewer resources. We are only providing the basics, which is life saving service." According to the UN, this simply means providing refugees with food and water. Outside the camp, locals harbor mixed feelings about the refugee population. Those who belong to the Nuer ethnic group are generally more welcoming because those arriving from South Sudan are from the same group. But the Anuaks say they feel threatened. We meet two Anuak men laying underneath a tree, tying to avoid the hot afternoon sun. "Many of these refugees come mainly from South Sudan. They strain our resources," one man tells us. "We are getting poorer and poorer, so the government should help us, too. If not, clashes will start between refugees and us." Our translator does not belong to the Anuak ethnic group. He is a highlander, and quickly urges us to wrap up our interview. It doesn't take much for ethnic tensions to erupt here. It's all about minimizing any risk that somebody in the group may turn against him -- and ultimately against us. It's amid these delicate issues of ethnicity, identity and struggles over jobs and resources that Prime Minister Abiy Ahmed is trying to shape a new, united Ethiopia. He has promised to provide opportunities for everyone -- and this means refugees and locals alike. But unemployment remains very high, especially among young people. It was a lack of prospects that spurred Ethiopians to take to the streets last year. They want jobs. And if Abiy doesn't deliver, it will only heighten already existing tensions over land and ethnicity. At the same time Ethiopia wants to maintain its open door policy for refugees. But with the conflict in South Sudan showing no signs of abating, it remains unclear how and when they will be integrated into Ethiopian society.